On the heels of announcing an autograph deal with NYC high school basketball star Sebastian Telfair, Topps announces that it is set to issue his first signed Topps item. But, its not a basketball card! 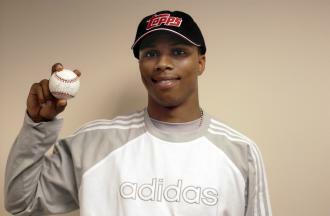 Telfair has signed and dated 100 Major League Baseballs, which will be sold exclusively at www.ThePit.com starting May 31st. Each ball, which carries a $49 SRP, will include a Topps 3M authentication sticker and be encased in a clear ball holder with a tamper evident seal. Telfair will also appear on packaging and will sign for several of the companys autograph trading card programs, which will be inserted into packs of 2004-05 Topps Basketball products. The first Topps product to feature autographed Telfair cards will be 2004-05 Topps Basketball, which ships this August. Telfair, who recently announced he would be entering the upcoming NBA Draft, is considered one of the best prep point guards ever. Because his cousin, Stephon Marbury, has been touting him for years, his name became legendary in basketball circles well before his days at Lincoln High School in Brooklyn.